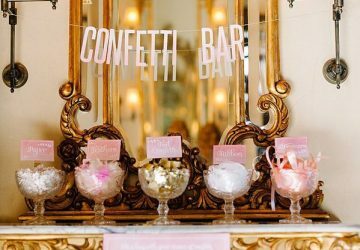 Are you going for a muted colour scheme for your wedding? 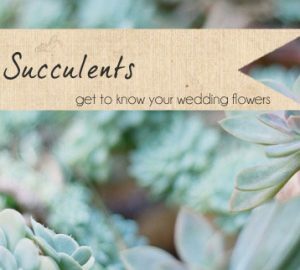 Soft pastel shades, perhaps mocha, soft green or maybe dusky pink… If you are, this weeks flower post may be just what you’re looking for. 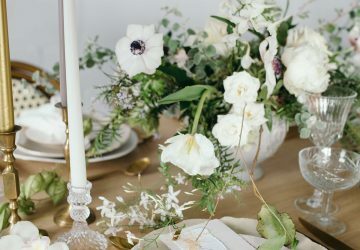 This week Karen Morgan of Passion for Flowers talks all about those soft coloured, muted toned hydrangeas, perfect for a vintage inspired wedding or to match a soft toned colour scheme. What season are muted toned hydrangeas available in? Muted toned hydrangeas are generally available from April to October. It is possible to obtain muted toned hydrangeas at other times of the year but these are then at a premium rate. Muted toned hydrangeas come in all shades of soft blue grey, soft green, pink and lilacs. Although per stem they can appear expensive they fill large spaces and are easier to work with than small delicate blooms. Would muted toned hydrangeas look good in a bridal bouquet? We love using muted toned hydrangeas in bridal bouquets; they look gorgeous en masse to give a blousy look and feel to a bridal bouquet. 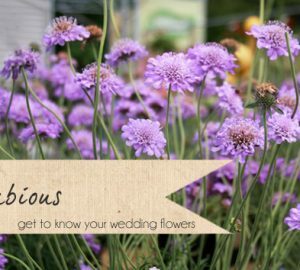 They can also be used as part of a mixed bouquet and look lovely with roses and country flowers. Do hydrangeas work for button holes? 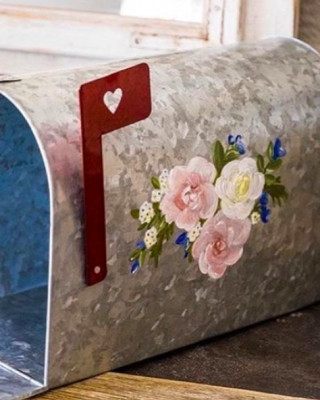 Hydrangeas look lovely for country style button holes, try combining a snippet of hydrangea with two vintage roses, gypsophila and a touch of eucalyptus for a country feel. It is best to mix hydrangeas snippets with another robust flower to give them structure as on their own they can become floppy especially in the summer heat. 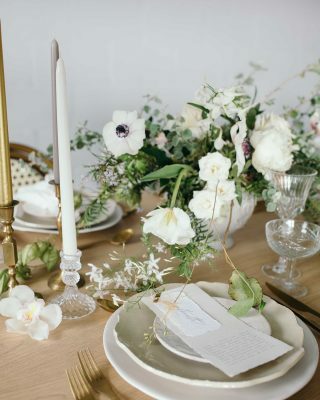 How can muted toned hydrangeas be used as table centre pieces? 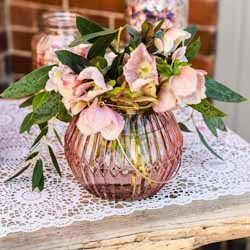 We love using muted toned hydrangeas with their range of colours for table centre pieces, they look great in urns or footed vases, in single stem vases lined down a long table, mixed with roses for a summer country garden look in a large vase or container. 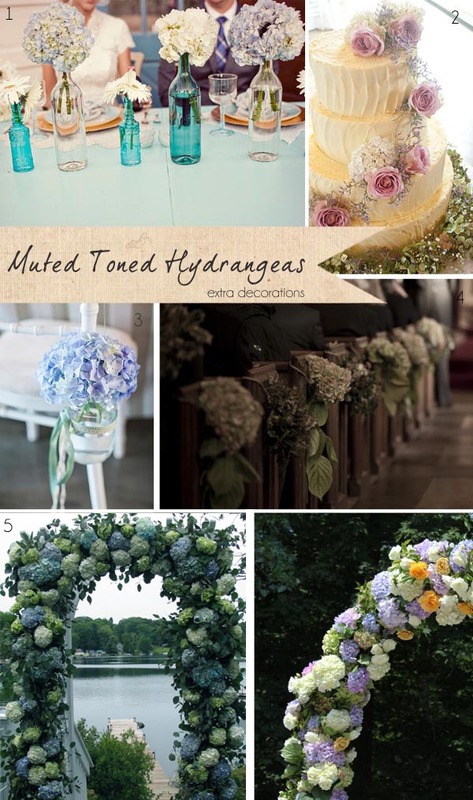 Where else can I use muted toned hydrangeas at my wedding? Muted toned hydrangeas are invaluable in large scale arrangements in churches or ceremony flowers at a wedding venue. 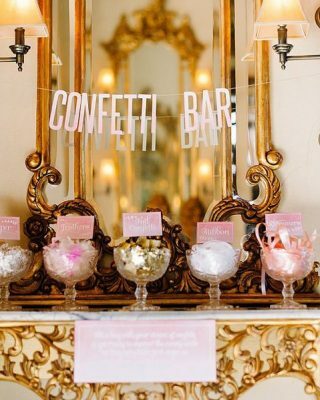 They are great for window sill arrangements in and around the venue, they can be used to fill large scale urns or containers for fireplaces or at the entrance to the venue. 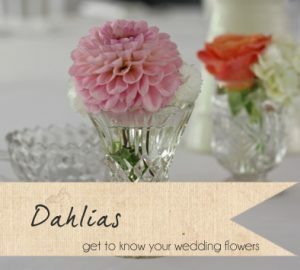 Hydrangeas look wonderful in a mix of bottles for an informal top table or dotted around your venue. Muted toned hydrangeas are great to use in a mixed arch for a church entrance. 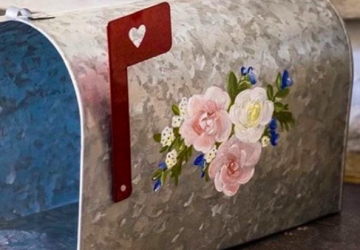 Hydrangeas make lovely pew ends either tied with lace or hessian or placed in a cute jam jar. What other colours do hydrangeas come in? 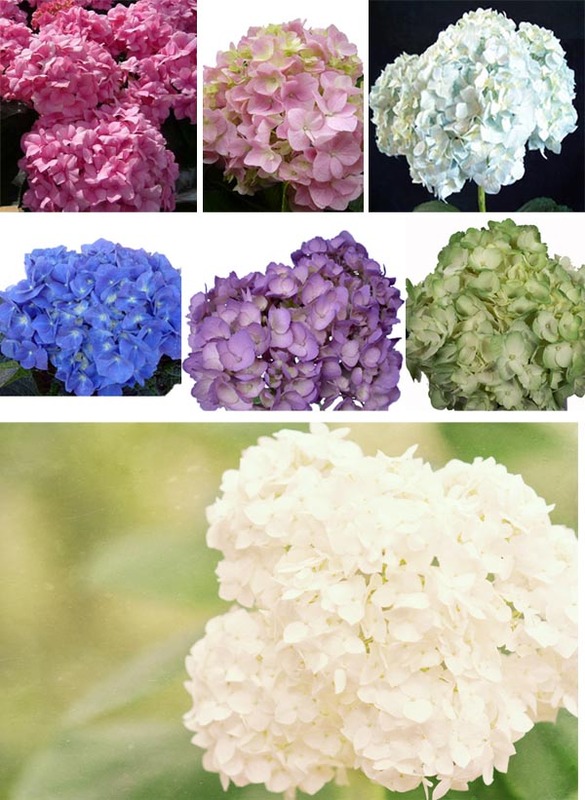 Hydrangeas are available in a wide variety of colours from blues in all shades and tones, from deep blue to china blue, light blush pink to deep pink, greens and even greyish tones. As the season progresses the colour of the original plain colour develops so the colours are seasonal changing in tone and depth during the year. 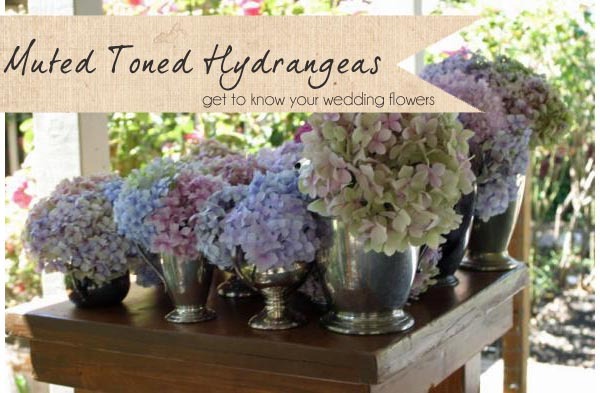 Do you have any conditioning tips if a bride was to use hydrangeas herself to do her wedding flowers? The stems should be cut at a 45 degree angle, foliage trimmed from the stems and then the hydrangea placed in a bucket with clean water and flower food. Never stand the hydrangeas in direct sunlight or near a radiator. Keep them cool.